I find gourds to be an amazing and interesting crop to grow. Gourds can vary from the small decorative gourds most popular for fall decorations and to the dishrag gourds used for cleaning. And who can forget the larger gourds that are used for canteens or even tables or toy boxes. I have grown almost every variety of gourd there is and in my zone 5 climate this can be a challenge. 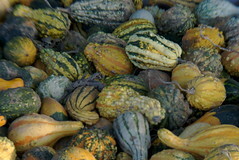 Many of the larger gourds can take 125 to 130 days to mature. This year in my crafting garden I am growing the smaller decorative gourds, two other small gourd varieties and the dishrag gourd. In my swing set garden I have nine gourd varieties growing and near the barn I have the bushel gourd and two rare gourds that are new to me this year. I separated them from my other gourds so they would not cross-pollinate and I would be able to save seeds. My swing set garden is exactly what I named it. I like to grow my gourds vertical so that insects do not bother them and so they grow evenly. Since they are very heavy I needed strong support so I use an old swing set. By placing a heavy layer of rotted manure in the triangular section of the set, I create a barrier against weeds and also supply a source of nutrition for the gourds, which are heavy feeders. I place heavy twine from the top of the swing set to stakes in the ground to supply support for the gourd to grow on. I also include flowers and sunflowers mixed in with the gourds to help attract bees for the gourds pollination. The flowers also add color and interest to the garden area. Growing gourds on a swing set has improved the quality and production. And later in the year I can cover the swing set with clear plastic if I need to extend the season for a week or two. 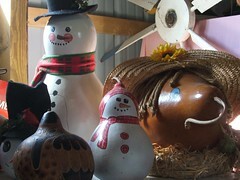 I use the gourds I grow for small furniture, gourd instruments, wall decorations, birdhouses and ornaments. Gourds are a fun crop to grow because you never know exactly what you will get and the gourd has so many uses.